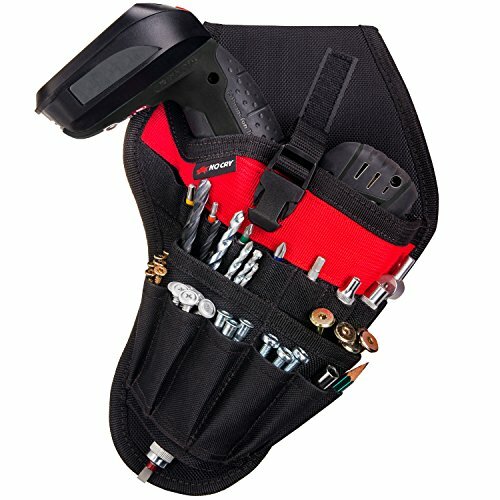 NoCry Fast Draw Drill Holster - Balanced Fit for Cordless Drills, Accessory Pockets and Open Loops for Tool and Bit Storage, Belt-Attachment by NoCry at Defy Now. MPN: NoCry25. Hurry! Limited time offer. Offer valid only while supplies last. Stop bending down to pick up your drillImagine having your drill right at your side whenever you need it...with no more bending down to pick it up. PRACTICAL. Fitted and balanced angled holster design with an open bottom holds your drill or driver securely while allowing it to go in and out without a hitch; 7 ¾ inch safety strap with plastic clip buckle fits even large drills and is velcro-backed to stay out of the way while you're working. HANGS ON YOUR FAVORITE BELT. This drill holder has an opening on the back to attach to your belt, padded belt, or tool belt up to 3 ⅛ inches wide; comfortable to wear even when carrying a heavy-duty impact driver or a cordless rotary tool. Designed to be worn on your right hip.